The production starts with Anthony (played by a very believable Simon Carrol-Jones) on stage as the audience enter, with Albert and Gar sat along side us observing. This device is kept up throughout the performance, and draws us further into the world of the play. We are casual voyeurs observing Gars world as it begins to crumble. 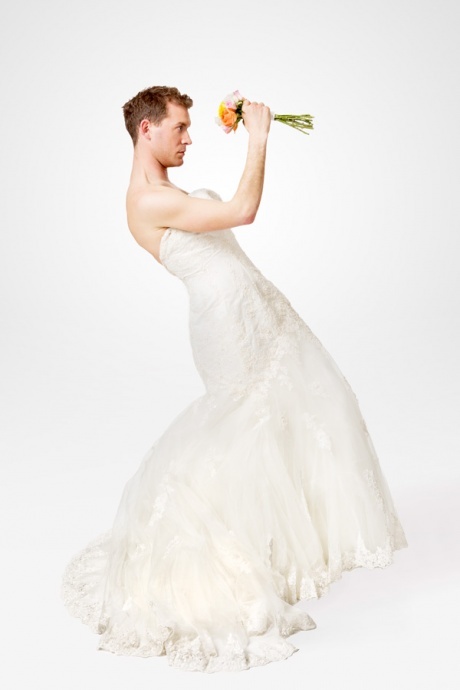 The production explores the modern homosexual dilemma of Heteronormativity – do we want to be just like the heterosexuals? And if so, what makes us different? We explore the world of dating apps (though it seems strange that Grindr is hinted at numerous times but never directly named) gay marriage, and promiscuity. Although the production is very much set in the modern day, the music jars. Each scene change is punctuated by 80s classics. Presumably this is to give an idea of the wedding party concept hinted at on the shows flyer, but instead it confuses the period making us question when the production is set. By the climax, This Much has almost become a queer version of Patric Marber’s Closer (without the casual misogyny) . John Fitzpatrick’s script is fresh and he is an exciting new queer voice, and this pared alongside great performances make ‘This Much’ a definite highlight of the fringe.